Deck Builder: Why Put A Hot Tub On Your Deck? Relaxation – The holidays are just around the corner. That means you’re probably juggling extra responsibilities such as travel planning and shopping, just to name a few. For us, nothing melts away stress quite like the occasional dip in a hot tub. Immune system booster – Believe it or not, soaking in a hot tub helps to stimulate your body’s natural production of white blood cells. The more of these cells you have, the easier it is for your body to fight off infections and viruses. You might find that the more you use your hot tub, the less often you get sick. Detox – Sweating is an effective way to remove toxins from your body. Obviously, after a few minutes in the hot water, you’ll begin to sweat. It’s no surprise why more homeowners are using their home spas for detoxification purposes. Sleep – Roughly 60 million Americans are affected by insomnia each year. If you’re one of them, think about taking a quick dip in the hot tub about an hour before going to sleep. When the body goes from a raised internal temperature and cools, you become tired. Pain relief – Here’s another common reason why homeowners purchase a hot tub. You’ll be amazed at how the combination of hot water and jets effectively relieve pain from fibromyalgia and arthritis. Remember to consult your doctor to see if a hot tub makes sense for you. Healing – Are you in the process of recovering from surgery or a major injury? Then you may want to explore hydrotherapy. Keep in mind that the increased circulation and blood supply to the impacted area allows you to recover quicker. Fun – We’re always looking for ways to spend more time with loved ones. When you get a hot tub, your place essentially becomes the preferred spot for family gatherings and celebrations. Nothing beats an evening of soaking in the hot tub and catching up with family members while some favorite tunes play in the background. Before getting too far ahead of yourself with hot tub plans, take a look at the space around your home. Is there room for a deck or a similar structure that can support a hot tub? Fortunately, the local deck builder at Ready Decks can help. When it comes to premade and prefab decks, our team of deck contractors has you covered. We strive to provide the highest quality site-built decks in as little as one day (seriously). 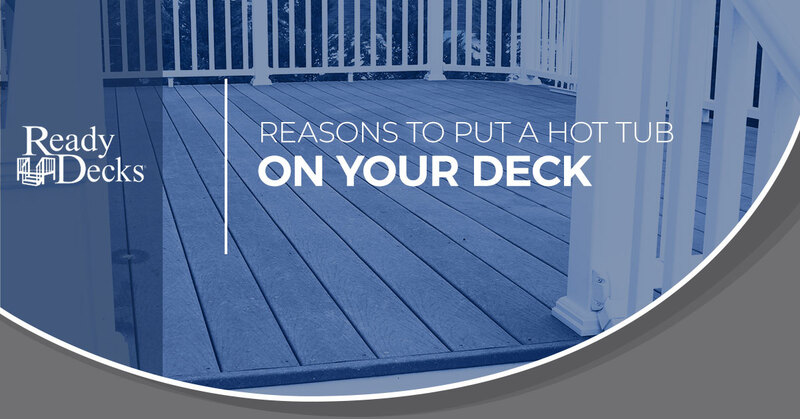 Best of all, the Ready Decks team offers homeowners the most bang for their buck. It’s no surprise why Ready Decks remains the No. 1 deck installer in the south. Whether you want a hot tub or could simply benefit from an additional living space outside, a beautiful, functional decks goes a long way. Contact Ready Decks for more information.